Cory Booker, the African-American Mayor of New Jersey, won a special election on Wednesday, October 16, to claim the state's vacant seat in the United States Senate. Booker beat conservative Republican challenger Steve Lonegan, a former mayor of the town of Bogota, 55 percent to 44 percent. The seat became vacant in June of this year when long-time Senator Frank Lautenberg died. There are 15 months left in Lautenberg's term. Lonegan, a tea party hero, was in favor of over-turning the U.S. Supreme Court's Roe v. Wade decision, opposed gay marriage, called Social Security a "Ponzi scheme," and the Affordable Care Act (aka Obamacare) a "train wreck." He has also called President Obama a "tyrant." He also favored the federal government shutdown that recently ended. Previously, as mayor of Bogota, he wanted to make English the official language of the town. 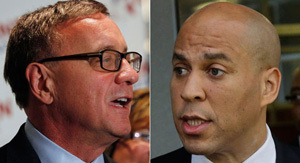 Booker did little to publicize Lonegan's conservative views. He even left the state for a West Coast fund-raising trip as Lonegan was hammering away at him. As a result the Republican steadily cut into Booker's lead. All polls showed the race narrowing as the election drew near. Some political observers were surprised that Booker's final margin of victory was so small. There is no rest for the weary, however, as Booker faces another primary in June of 2014 and then, should he win that, the election in November 2014 for a full six-year term. Republicans everywhere in the state who initially thought that Booker's star quality made him unbeatable are taking a renewed look at the 2014 election.